Location: Argelès-sur-Mer, in the Pyrenees-Orientales departement of France (Languedoc-Roussillon Region). Notes: Château d'Ultrera (sometimes Frenchified in Ultrère, Oltrère, Catalan or Ultrera Oltrera) is a castle, now in ruins, situated atop a steep rocky spur of the Albères, in the department of Pyrénées- Orientales. 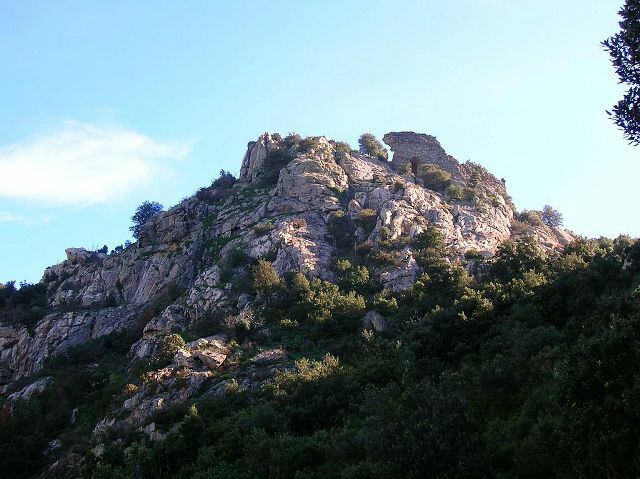 It is about the town of Argelès-sur-Mer, but it is historically linked to the town of Sorède.Ultrera Castle stands on a barren rocky outcrop watching the plain of Roussillon and the gorge Lavail. It is part of a group of fortifications (the watchtower of the Massana and the ancient castle of Montbram, located above the hamlet of Lavail) designed to defend and monitor the natural passage between the Roussillon and Catalonia. This highly strategic point was fortified by the Romans, probably at the time of the conquest of the Iberian Peninsula, but the castle is mentioned in any Roman writing known to date. However Perpignan a scholar Alart the nineteenth century assumed that the building dates back to the time of the wars of Sertorius, Pompey and Julius Caesar (82-47 BC.) Who disputed the possession of Roussillon to many times. There is very little of the Roman castle, the majority of the building dating from the Visigoth period (life - seventh centuries). It is mentioned for the first time in a historical text in the year 673 by Saint Julian, Archbishop of Toledo, who recounts taking Ultrera by the Visigoth king Wamba to Duke Paul supporters, one of his lieutenants infidels who had proclaimed himself King of Septimania. During the Middle Ages the castle was attached to the lordship of Sorède. The lords of Sorède being qualified Lords of Sorède Ultrera and they resided in the castle of Ultrera to build a stately home in the village. Around 1000 they built the castle chapel (the chapel Sainte Marie) (Romanesque) dedicated to the Virgin, who then became a place of pilgrimage and a hermitage. It seems that between the fifteenth and sixteenth century, the hermit was the only one to occupy the premises abandoned by the garrison.